This weeks lessons were concentrated on the group reflections of last year; I encouraged the children to talk about the pros and cons, and the feedback was really positive. 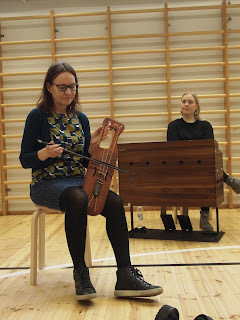 The most nicest things mentioned by the group were both of the new introduced instruments (kantele and djembe), some particular songs we've learned and e.g 'everything'. One of the aims and intents of this blog is hopefully to create conversations and build productive forums to reflect this project. Really looking forward on some parent commenting on something in here! I showed the blog today for the class, and the children were really excited. Today, after the reflecting conversations, we continued with the djembes. Today's lesson was included with some nice rhythm exercises with rhymes (from the book 'Yökyöpeli') and we also started to learn four songs by Marjatta Meritähti (Aa aa ankka, Ihahhaa, Ulla pieni karitsa and Öö Öö). Class was invited to participate in spring at Käpylä Musiikkiopistos big concert where these songs will be performed. Children will be a part of a bigger choir assembled from different primary and music schools.